I was extremely eager to have a Sunday lunch at The White Hart in Brasted (near Westerham and part of Sevenoaks in Kent). 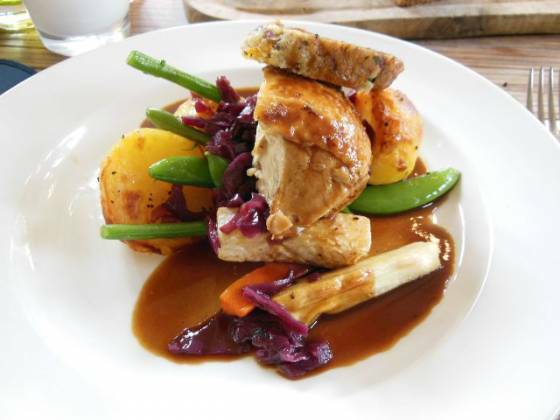 We have actually reviewed two of sister pubs of The White Hart; have a look here for Sunday lunch at The George in Hayes, Bromley and also Sunday lunch at The Plough Inn, Eynsford in Dartford. 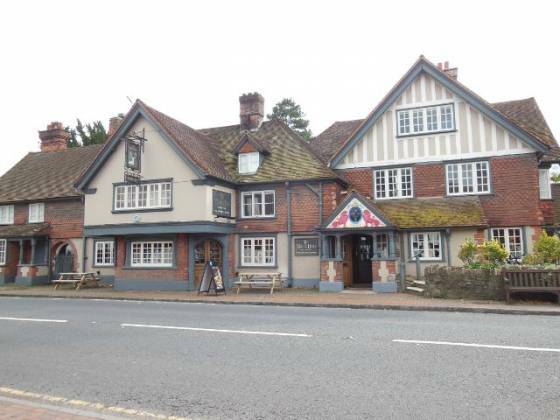 Also, we reviewed a pub very close by, in Sundridge – The White Horse. So, I was very interested to see if The White Hart is up to scratch. I booked online for Sunday lunch at 12:30pm, and received an email as well as a text message with my booking details. On the day, we got stuck in traffic (and I got a bit lost with driving, trying to navigate without GPS! ), so gave them a call to let them know we were going to be late… The table was needed at 2;30pm, so it just meant we had less time to eat. This was ok though, I wasn’t interested in having a 3 course meal, only a main and possibly (well, definitely) a dessert. A drinks order was taken – I had a lager shandy (Becks Vier – £3.45), Claire chose a diet coke (£2.30). We actually visited The George in Hayes yesterday for some lunch; I noticed the main menu looked exactly the same (which isn’t a bad thing). Perusing the Sunday lunch menu, it also had the same options as The Plough Inn – seems like the Group follow the same (excellent) formula. The Sunday lunch options were: Roast Lamb, Roast Chicken with Stuffing, Roast Pork with Crackling and Roast Beef with Yorkshire pudding. I was wondering why the lamb was a lot more than any of the meat (£4 more than the beef, £6 more than the pork) – so I had to try it (I believe I did a similar thing at The Plough Inn :-)). Claire went for the Roast Chicken. We were asked if we wanted some bread to share, yep. 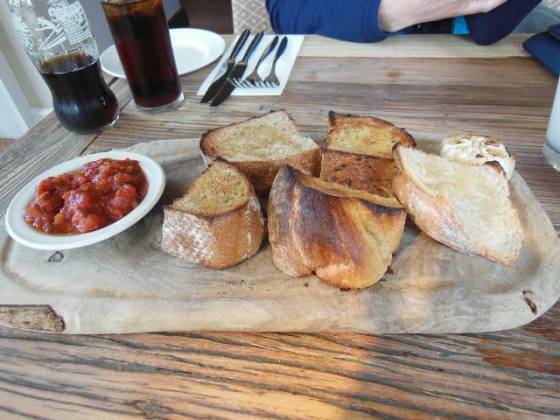 A bread board was brought out after a couple of minutes, consisting of 5 chunky, toasted slices, varying from whole grain (with seeds on the crust), to white bread. A roasted garlic was on one side and a dish of salsa on the other. I requested some butter as well. This took a few minutes, and only had two very small squares – just enough for one slice each. The bread was extremely tasty, but I did think it was for free (instead of £4.85 – more on this in a moment). One problem early on, almost as soon as we received the butter, our Sunday roasts came out! It was literally 5 minutes after ordering! To be honest, this really irked me – if the food was coming out quickly, then the upsell with bread shouldn’t happen. This meant Claire and I had to leave some bread to enjoy a hot lunch (fast forward to the end – the waitress took the bread off the bill without me asking; whilst some would say this should have happened as standard, she very much clawed back the “irkness”). Our Sunday lunches looked good – I had 4 slices of lamb, Claire had a large breast of chicken. These were balanced on 3 large roast potatoes and various vegetables. Claire also had stuffing on the side. There wasn’t a lot of gravy, so I requested some more which was quickly brought out without any fuss. Tucking in, the roast lamb tasted wonderful. I think it was cooked with garlic as it had a nice flavour. I tasted some of Claire’s chicken, it was moist and cooked with herbs. The roast potatoes were quite good, a bit of crunch and also fluffy inside – Claire would have preferred them to be more crispy though. I liked the fact they were properly seasoned, something other roasts sorely lack. I sampled the stuffing, it was sausage-meat with some apricots, again tasted nice and complimented the chicken well. The vegetables were a medley of (are you ready? ): red cabbage, mange tout, roasted carrots, roasted parsnips and green beans (I also had one tenderstem of brocolli – Claire didn’t have one of these). All of the veg tasted fresh and cooked perfectly. Whilst the portion wasn’t huge, I appreciated the big mix. It meant that every mouthful was different. To top it all – the gravy with the extra jug I was please with the quantity (no way I could have eaten without the extra, it would have been far too dry with 3 roast potatoes). It was excellent and gave even more taste to the otherwise very nice Sunday roast. I did comment to the waitress when she came to clear the plates, that the Sunday lunch was brought out far too quickly to enjoy the bread. She apologised when bringing the food out earlier; after I commented she said that “the kitchen was a machine today” and some lunches were coming out quickly (I think this prompted the bread to be removed from the bill). The dessert menu was brought out next, both the standard one and also the “specials”. After looking over them, I was torn between the Sticky Toffee Pudding (£5.25), Creamy Banoffee Pie (from the specials menu – £4.95) and the Banana, Dulce de Luche, Brownie & Italian Vanilla Gelato Coupe (! – £4.95). I asked the waitress what a “coupe” was – she said it was ice cream with a sponge bottom. As I have had banoffee pie a few times recently, and sticky toffee pudding is a favourite, I decided to try something new and went for the coupe. This was served a bit longer than the main course, taking about 15 minutes. 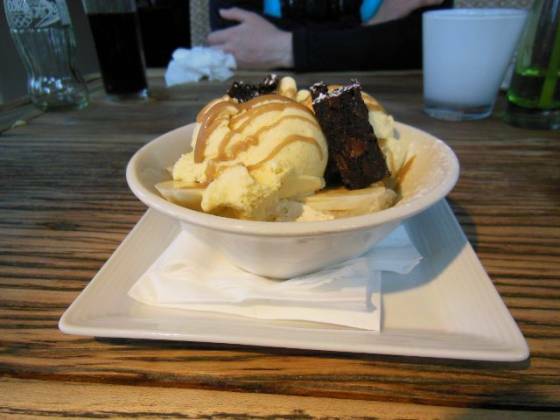 It arrived in a bowl, with three scoops of vanilla ice cream, sauce and two small chunks of brownie which was on top of some slices of banana. Lastly, underneath it all, was some cream – no sign of the sponge. It reminded me of an upside-down sundae. I do feel the waitress should have known the dessert as it was on the main menu – this brings me back to a point I mentioned in the Sunday lunch review of The Fox & Hounds in Toys Hill, that in my opinion all the staff should sample every dish on the menu so they can recommend dishes (this goes the same for wine – unless they do not drink, they should all attend a wine tasting course with the venue’s wine selection for the same reason). It was quite a simple dessert, being just ice cream but the brownie had a nice, chocolatey taste with a crunchy texture (from hazelnuts, I believe). So, my conclusion. The venue is fabulous – with a couple of open fires, great decoration (other parts of the pub / restaurant had nooks and crannies) and brightly lit, Claire made the comment that this would be excellent for a special occasion (or even a Christmas Day lunch in the future). The food quality was as near top quality as I could have wished (the potatoes were the only thing I would like to see cooked for a bit longer). I especially liked the varied vegetables, I can’t remember when I had such a selection. The waitress, on the whole, was great – friendly and welcoming, she was always walking around to be on hand with any issues. Whilst I was annoyed about the bread (and The White Hart would have lost points on this), she clawed it back by removing it from the bill without me even asking. As I mentioned earlier, I do think the staff should know every dish on the menu to help advise the customers. 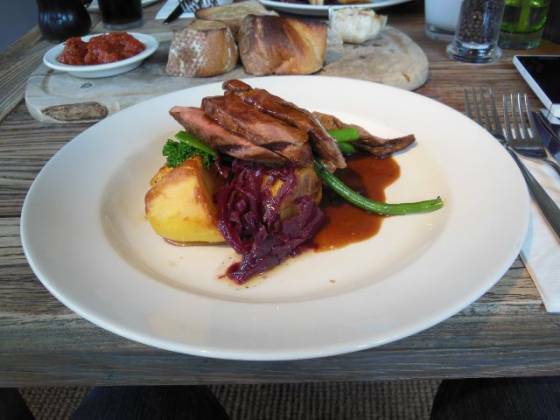 But, the high quality of food, wonderful venue and otherwise good service means I award a Top Rated award of 5 plates for Sunday lunch at The White Hart in Brasted. An excellent choice for a celebratory meal, special occasion or just a very nice Sunday roast.